Give varied, high-quality feed according to need. The same food day after day, however healthy it may be, is boring in the long run and spoils the appetite. Comparison may be made here with humans. Promote natural behaviour and increase interest in the aquarium by changing the type of feed often. This gives the fish a variety, such as they are accustomed to in the wild. There is not only one type of food swimming around there either. As well as the staple feed types, JBL also has a range of special feeds, e.g. freeze dried mosquito larva, daphne, tubifex and others in their natural state which help you to add variety to the aquarium. Feeding according to need means: in order to offer a variety of feed you should not give just any combination of different fish feeds, but choose them to meet the needs of your fish according to the criteria already described in detail. You have a mixed aquarium with a few surface fish, more omnivorous fish of the middle water levels, and a few plant-eating ground fish. A varied feeding programme meeting the needs of this aquarium could be as follows: As staple feed JBL NovoBel, JBL GRANA and/or JBL NovoFil red mosquito larva and/or JBL NovoDaph daphne for the fish in the middle water levels and finally JBL NovoFect green feed tablets for the plant eating ground fish. Now and then you can fix a JBL NovoTab feeding tablet to the glass for the fish in the middle water levels or drop one to the ground fish. You can also improve the brilliance of colour and the health of your fish by feeding with JBL NovoColor, JBL GALA or JBL KRILL as staple feed. JBL KRILL is a flake feed which includes krill that has been finely ground in a special mill. This eliminates the danger of injury to the intestines of fish caused by the spines of krill. If, for example, you have mainly "plant" orientated fish such as viviparous fish, the feed must of course contain suitable plant matter. 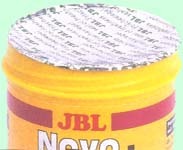 Here you could use JBL NovoVert as staple feed, for example, supplemented with various special feeds. Use the table on page 22 of this brochure to compile a feeding plan exclusively for your ornamental fish. All JBL feeds are made up of high quality, selected, natural raw materials which, of course, have a limited shelf-life. Vitamins and unsaturated fats in particular quickly deteriorate after coming into contact with light or air. Flaked feed should therefore not be purchased in plastic bags or other transparent packaging. We recommend the purchase of fish feed in light proof and air tight containers, in quantities sufficient for a maximum of 2 months. In other words, do not buy litre tins, for example, for an 80 litre mixed aquarium, but instead staple food in 250ml containers and special feeds in quantities of 50 or 100ml. In this way you can be sure that your fish always get top quality, fresh feed. JBL offers a wide range of sizes of containers. In addition, each tin of JBL feed has a use by date. This only applies to unopened tins. Varied, specific to needs, quality conscious the wide variety of JBL feeds means that you always make the right choice. All JBL feeds are produced strictly according to demand, thereby guaranteeing absolute freshness.